I’m working on a small project, my dissertation (NBD) and it focuses on how we make meaning online. How we negotiate things that aren’t generated online and don’t live exclusively online using the tools and affordances of this particular medium. I’m interested in this because it is the affordances of this technology among others that has enabled certain facets of my journey to understand life with a diagnosis or as a sick person. Though I don’t self-conceptualize myself as either of those things truly. This project as much as it will be an exploration into the lives of others is a way for me to cope with all the new, conflicting and complicated ideas I’ve faced in the last year and a half. I’ve had to reframe myself and watch as others reframe me as well. Maybe I inspired a few people before with my love of humanity and desire to see it be its best, my ability to give a cogent and powerful motivational speech replete with metaphors of butterflies and rebirth, my willingness to leave a high paying job to pursue the fickle goal of being happy, or my devotion to my family. Maybe those things inspired you. Maybe they didn’t. But add a brain tumor to it? And I am a bona fide inspiration. Even though in being a ‘brain tumor survivor” I’ve lost some of the gusto in my impassioned debates and I’ve become somehow quieter, calmer, perhaps funnier, and maybe even more easy going. Or maybe I’ve just stayed the same. Maybe I laugh to loud because I see my chance to laugh and I may never have it again, or maybe I try to make you laugh for the same reason. Or maybe I don’t. Maybe I don’t laugh enough or make any difference at all. I don’t know and it’s strange because I embody this contradiction you can feel in every word that I type to this screen. I hate that what inspires you is my desire not to die, so I fight to live. But, I love that it inspires you too. I didn’t die. I could have. I could be more pissed. I could be more crabby (ok, I know, I get crabby sometimes). I love that it inspires you to be better in your everyday. I love that you see pain, you feel empathy and you are inspired. I love that you make change in your patterns, moves, and love because you see in me a struggle you hope to never face. I hate it, but I love it. I only wish we could all inspire one another more fully before death, destruction, trauma or disease come knocking at our doors. Are we really so busy we can’t see one another until we’re forced to at the end of a loaded gun with a finger pressed shakily to the trigger? I had merit before Herbert, I’ll have merit after he’s gone. Does merit warrant inspiration or is it just struggle? Is it overcoming that struggle that inspires or just being in it? Is it smiling in the face of struggle and making it truly feel like a joke? Because I’m good at that one, and I will say it’s the laughter that inspires me. I had my birthday this month and it was different from last year. Last year I had a tearful lunch with a friend, tears of joy that I made it. I moved slowly from lunch, to the car, to home to bed. I needed to be in bed before birthday dinner. Too tired to change out of my birthday dress, I curled up in my childhood bedroom at my parents house in a beautiful dress, plunked my computer on my lap and thought I’d just take a break. What I quickly realized is that when you have no idea what recovery will be like and you just had your first brain surgery, you don’t really know what it means to take a break. 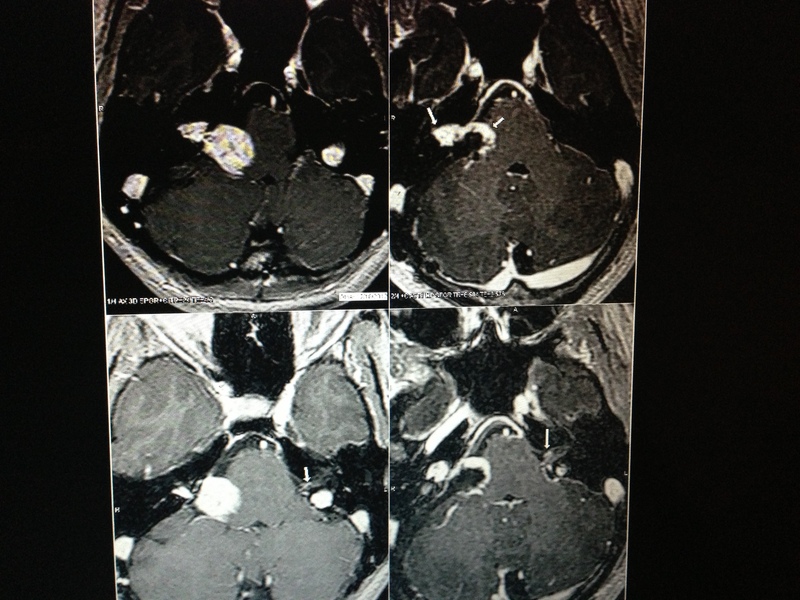 I put my MRI in the computer, I combed through reports about irregularities and tried to envision new tumor sizes as compared with old tumor sizes. I would text my sister pictures and ask her to identify things. Little did I know I was looking at completely the wrong thing, it really didn’t matter what I was trying to look at, I was seeing a lot of things and they all looked like they could be a match to the overly clinical complicated words in the report, so I panicked. Using the tech available to me in bed, I grabbed my cell phone and took a picture of the MRI on the computer and sent it to my sister. “I’m pretty sure it’s a blood vessel,” She told me calmly. “Now what do you see? !” I asked her feeling a bit perturbed. Hmm, fine. 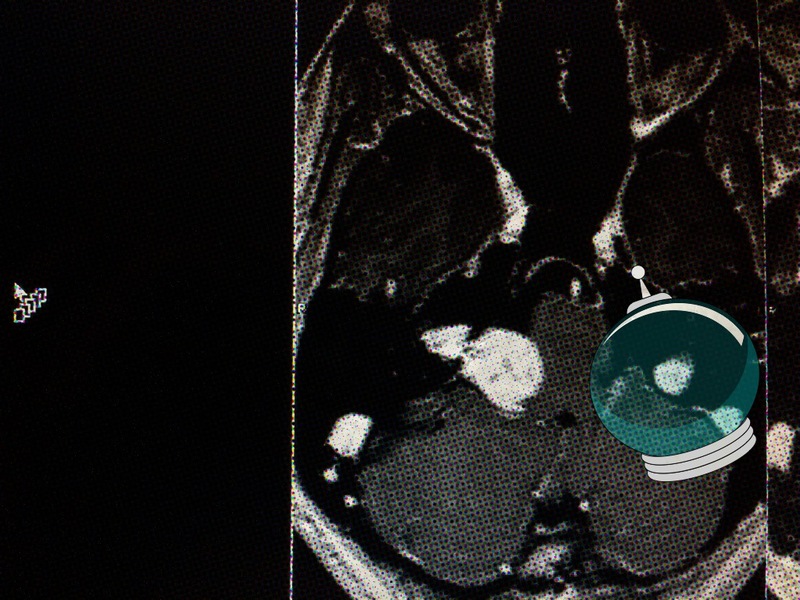 I learned later when I looked at the MRI with my doctor, they already put little arrows where you are supposed to look, so you don’t really need to scour your iPhone apps to find a space helmet that fits perfectly over what is worrisome. If you look back at the first pic, you’ll see the arrows if you bother to look hard enough. Whoops. I was so busy panicking over blood vessels I had obscured the things I was really supposed to be looking at. I couldn’t see what was plainly right in front of me. I couldn’t see any of it. It was my birthday, I was alive, and I was worrying about the potential of the thing that didn’t kill me yet that might cause me a problem that I could not fix or address from my bed anyway. This year on my birthday, I spent it enjoying the people around me. Wedding shopping with my big sis, dinner with family and friends, quality time with Jason. No tears, just reflection, gratitude and happiness, oh and hibachi (which was delicious). It just makes you think about what inspires us everyday. Perhaps for a moment it is a fear of dying and that can be productive, but it could also just be a desire for living. Wanting to live isn’t selfish, it’s revelatory. I used to be embarrassed to dance at concerts. I used to hold my arms close in and bounce around slightly on one knee, always afraid to look stupid. Now? I dance, and yes I don’t know what to do with my arms and I have to stop every time I trip over my own limbs and lose my balance and feel my vertigo, but I dance. I don’t care if someone thinks it’s cute or ugly or dumb or fun. I’m going to feel the music, I’m going to dance. Life is my goddamn dance party. Maybe that inspires you, maybe it doesn’t, maybe it’s too simple to be inspiring. Maybe I just don’t want to miss another dance, or maybe, just maybe, I want to live. This entry was posted in acoustic neuroma, brain tumor, BrainTumorThursday, healing, health, hope, humanity, humor, life. Bookmark the permalink. Happy birthday! Glad to hear you had exactly the day you wanted! Your relationship with Herbert could be diagnosed as a Stockholm Syndrome- attachment to someone-who has usurped our personal power to enable control over our life- like a kidnapper or someone on whom we rely because we have no choice. We lose ourselves to survive. We have no choice. Eventually, with time and in your case, with surgery, the abductor loses his power over the person.